Figure 6-18 Submarine pipeline installation procedures. 63.6.1 Bottom Pull. The bottom pull installation is ideally suited for the installation of short (10,000 feet or less), small diameter pipelines for ship-to-shore fuel transfer operations. In a bottom pull installation, the pipe is preassembled into short sections (100- to 1,000-foot lengths) at a launch site located adjacent to the shore crossing. A pulling barge is moored offshore of the launch site and along the centerline of the pipeline route. The pulling barge is equipped with a mooring system and a pulling winch. Using its pulling winch, the barge pulls the pipe string offshore one section at a time. A pull-head is attached to the offshore end of the pipeline which seals the offshore end of the pipeline and provides an attachment point for the pull cable. As each section is pulled offshore, a new section is added to the pipeline onshore. The pull barge advances along the pipeline route by pulling on its bow winches while simultaneously paying out on the pipe-pulling winch as the water depth increases. When the pull barge reaches the position of its bow anchors, the anchors are retrieved and repositioned ahead of the barge to begin the pulling cycle again. A separate vessel is used to move anchors. The bottom pull installation procedure was the method selected for the installation of the now discontinued U.S. Navy Bottom Laid Pipeline Subsystem (BLPS). As utilized in this system, a Side Loadable Warping Tug (SLWT) was employed for the installation vessel. The pipeline was constructed using sections of commercial well casing (steel pipe with threaded ends; both ends joined inside threaded a couplings). Powered pipe tongs were employed to assemble the pipe sections. If project resources permit, the efficiency of the bottom pull method can be increased by the utilization of a longer pulling cable and high-capacity linear cable pullers. These modifications are quite common for the installation of river crossings by the bottom pull method. 6.3.6.2 Bottom Tow. The bottom tow installation method is a variation of the bottom pull method. For tactical pipelines, it is suitable when the pipeline assembly site cannot be located adjacent to the shore crossing. In a bottom tow installation, the pipeline is assembled (in sections) on land. It is then pulled offshore by the tow vessel one section at a time, until the entire pipeline is assembled. The pipeline is then towed to the designated location. For a ship-to-shore POL pipeline, the tow cable is transferred to a pulling winch located at the shore crossing and the pipeline is pulled ashore at the beach crossing. With the bottom tow method, the pipeline is installed air-filled to reduce the towing forces. If the tow route extends into deep water, the pipeline may also be pressurized (generally with an inert gas) to prevent pipeline buckling or collapse due to hydrostatic pressure. The bottom tow method can also be employed for longer pipelines (much greater than 10,000 feet) by outfitting each pipe section with alignment sleds and mechanical connectors at the ends of the pipe strings. Each pipe section is then pulled into position and connected with the previously installed section (see Figure 6-19). Installation of a long distance pipeline by sectional bottom tow is illustrated in Figure 6-19. In this illustration, pipe strings are launched from the mainland assembly site and towed along the pipe route to an offshore island. The first pipe string is pulled ashore upon reaching die island. The second string is then launched and towed into position behind the first string. After arriving at the offshore island, the tow line would then be disconnected from the second string. 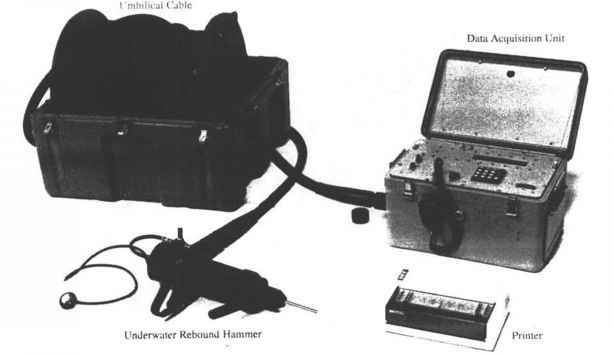 A diver would then connect a cable to the second string which would be routed through a receiver sled (installed at the trailing end of the first string) and then up to a surface barge moored above the receiver sled. A deck winch on the barge would be used to pull the leading end of the second string into the receiver sled (Figure 6-20). Mechanical connections are used to join the two pipe strings. The process would be repeated until the entire line is complete. 6.3.6.3 Off-Bottom Tow. The off-bottom tow is a variation of the bottom tow procedure. In the off-bottom tow, the pipeline is equipped with drag chains and buoyancy tanks which suspend the pipeline a few feet above the seafloor. 12 horns after the tow vessel arrives on site. • Minimal land-based equipment and site preparation requirements at die shore crossing. • Smaller tow forces due to the lack of pipeline contact with the seafloor. • Smaller pipeline stresses induced by changes in the seabed topography. • Minimal risk of damage to the pipeline and corrosion coatings due to bottom abrasion. In a bottom or off-bottom tow, the design of the pull-head is determined on a case-by-case basis. For a shallow-water, small diameter pipeline where the offshore tie-in can be easily accomplished by divers, a simple pull-head arrangement such as that employed in the BLPS (see Figure 6-21) is sufficient. In this case, the pull-head serves only as a bolt-on attachment point for the cable and a simple "padeye" type design is employed. Bottom tow installation procedure for long distance pipelines. Integrated pullhead and pipeline receiver design. Figure 6-21 BLPS pull-head bottom-laid pipeline. In deep water, or for longer pipelines, one or both ends of the pipeline will require some form of structure to facilitate subsea tie-ins. In these situations, the pull-head and receiver structure designs are integrated (see Figure 6-20). As tie-in structures can become quite heavy, buoyancy tanks are often used to offset the weight of the tie-in structure. The buoyancy tanks also serve to elevate the leading end of the pipeline above the seafloor. This serves to protect the pipeline against damage during the tow-out due to isolated bottom features or abrupt changes in bottom contour. After the pipe has been pulled into position, the buoyancy tank is flooded. This increases the submerged weight of the receiver sled which is necessary to reduce the pull-in forces during the tie-in operation. 6.3.6.4 Surface Tow. The surface tow is suitable for installations where the makeup site cannot be situated at the shore crossing and bottom obstructions preclude a bottom or off-bottom tow. In the surface tow method, pontoons are used to float the pipeline on the surface of the water. During the tow, a hold-back vessel is positioned at the trailing end of the pipeline. The hold-back vessel exerts a tension on the pipeline that serves to limit installation stress and is used to control the position of die tailing end of the pipeline. A disadvantage of the surface tow procedure is the risk of pipeline damage during the tow-out due to surface wave action. 6.3.6.5 Below-Surface Tow. The below-surface tow is a variation of the surface tow and is used when severe seas are expected (or could occur) along the tow route. Like the surface tow, it is suitable where the' makeup site cannot be situated at the shore crossing and bottom obstructions preclude a bottom or off-bottom tow. Unlike the surface tow where the pipe floats are attached direcdy to die pipeline, in a mid-depth tow a pennant is used to secure the float to the pipe, thereby suspending the pipeline below the water surface and protecting the pipeline from wave action. As with the surface tow, a hold-back vessel is used to limit installation stresses and control the tailing end of the pipeline. Both the surface tow and the below-sur-face tow require careful planning and detailed towing procedures to ensure a successful operation. 6.3.6.6 Reel Boat. The first pipeline laid from a reel was completed as part of Operation PLUTO (Pipe Line Under the Ocean) during World War 11. Fuel lines were laid across the English Channel to supply Allied Forces after the Normandy invasion. Several 3-inch-diameter lines were wrapped onto large floating spools in 25-mile lengths and towed by tugs from an English staging port to the Normandy Coast (Kunzi and Uyeda, 1979). Reel boats operated by marine contractors range up to 600 feet in length and are capable of installing pipelines up to 16 inches in diameter in water depths up to 1,000 feet. For tactical pipelines with relatively small vessels of opportunity, the reel boat method is suitable for installation of small diameter lines only (approximately 4 inches or less) in water depths of 120 feet or less. Equipment requirements for pipeline above this size preclude installation from Navy vessels. Nonetheless, the reel boat method is a cost effective, simple, and reliable installation. An overview of the reel boat method is illustrated in Figure 6-22. In this method, prefabricated coils of small diameter pipe are reeled off the installation vessel. Each reel could contain up to 2,500 feet of 3-inch pipe. Stress in the pipeline is controlled by a slight hold-back tension applied at the pipe reel. When each reel of pipe has been deployed, the end of the pipe is sealed, and the pipe is lowered to the seafloor and marked with a buoy. The reel boat then returns to port and exchanges the empty pipe reel for a full one. When the reel boat returns, it recovers the end of the previous pipe string and connects the end of the new pipe reel using a flange connection. The process is then repeated until the second end (i.e., island end) tie-in is performed. At the island end, a short length (600 feet) of pipe is floated out to the reel boat. The connection between the last two sections is made at the reel boat. A shore winch then applies a slight tension to the floating pipe string while a diver removes the pipe floats to gradually lower the pipe to the seafloor. The four point mooring spread is required for the installation vessel during the pipe recovery, tie-in, and abandonment operations. During laying operations, only propellers or thrusters are required for positioning. Stern winch(es) may be employed for additional pull forces if a simultaneous lay/bury operation is used as shown in Figure 6-22. For a small vessel working 8 hr/day, a production rate of 2,500 ft/day should be easily attainable. Depending on the size of locally available vessels, higher production rates could be attained if several reels could be deployed in sequence from the reel boat. A typical deck layout for a reel boat installation method is shown in Figure 6-23. The installation equipment has been laid out on the deck plan of a Side Loadable Warping Tug (SLWT) mated to a Non-Powered Causeway Section (CSNP). These are roughly 90- by 22- by 5-foot platforms and serve to illustrate the minimal space requirements for this installation procedure. It is possible to outfit commercial flat-top barges, spud barges, or oil field supply boats with similar layouts. Figure 6-22. Reel boat installation procedure. 6.3.6.7 Lay Barge. The lay barge procedure is the predominant installation method employed for installation of long distance oil and gas pipelines in deep water. In a lay barge installation, the pipe string is fabricated by joining individual pipe sections on the deck of the lay barge. A curved ramp or "stinger" is used to limit bending stresses throughout the overbend region of the pipe. Bending stresses in the sagbend region (at seafloor) are controlled by a pipe tensioner aboard the lay barge. The tensioner grips the pipe and applies a constant tension to the pipe by pulling against the bow mooring lines. The lay barge advances along the pipeline route by pulling itself forward on its bow anchors and simultaneously paying out on its stern anchors. During the move-up operation, the pipe is paid out under tension by using the bow winches to overhaul the pipe tensioner. An attendant fleet of anchor handling boats, supply boats, and/ or material barges complete the installation spread. For small diameter pipelines, Navy SLWTs/CSNP/CSP or local vessels can be outfitted to serve as lay barge and support vessels, assuming a fair weather operation. In a traditional commercial oil and gas submarine pipeline, steel line pipe is employed for the pipeline and joints are welded, coated, and inspected on board the lay barge. For Navy POL pipelines, well casing with threaded connections can be employed. Hydrostatic tests should be performed on each joint after assembly before advancing the barge. The hydrostatic test can be performed by inserting a small diameter pipe with inflatable packers into the last joint on the lay barge. The packers would be inflated to seal the pipe at the joint. Water would then be pumped through the 30-mm pipe to perform a hydrostatic test on each joint as it is added to the pipe string. 6.3.6.8 RAT Method. This method was developed by French commercial contractors. The abbreviation RAT stands for: Remouiquage (towing), Arboutage (tie-in), and Tension. In this method, long pipe strings are p reassembled on land and surface towed to location. A surface tie-in is then performed at an installation vessel which is moored over the previously installed pipe section. The surface vessel is then used to tension the pipeline and lower it to the seafloor. Although this method is seldom employed in practice, it is suitable for a calm water site and is capable of a high production rate. 6.3.6.9 Directional Drilling. Directional drilling for most pipeline installations is a low production, equipment intensive, and highly specialized operation which is generally employed only when unique site conditions are encountered (e.g., for a river crossing of a busy navigated channel). However, for small diameter pipelines (3 inches or less) directional drilling is not unduly equipment intensive and may be suitable for unfavorable site conditions at shore crossing locations (e.g., rock cliff adjacent to shoreline, potential for ice scour, wildlife preserve where shore crossings are prohibited, etc.). In a directionally-drilled installation, the drill is located behind the shore crossing and a pilot hole is slant-drilled under the river or shore crossing. After the directional bit "daylights," the directional drill bit is then removed and a larger diameter reamer bit is installed. A pipe string is then attached to the reamer bit using a swivel connector. The reamer bit diameter is usually 120 to ISO percent larger than the diameter of the pipe string. The drill string (with reamer bit attached) is then rotated and slowly pulled backward through the pilot hole. As the drill string is withdrawn, the reamer bit expands the diameter of the pilot hole and pulls the pipe string through the shaft. Drilling muds may be pumped through the drill string to lubricate and support the shaft during the pipe pulling operation. If the soil conditions are such that drilling mud will not keep the hole open, a casing is installed from (he shore end. In the case of a river crossing, the pipe string is prefabricated and located on the opposite bank from the directional drill. 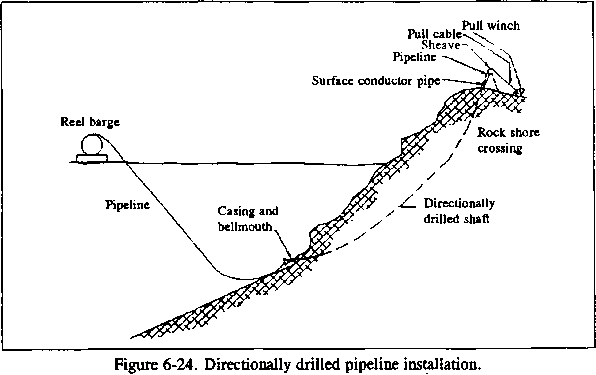 For a directionally-drilled shore crossing, the pipe string is staged offshore (e.g., reel barge, bottom pull, etc.) and fed into the drilled shaft from the offshore end (Figure 6-24). Sophisticated guidance systems for directional drilling applications are commonly employed in oil and gas operations. However, less sophisticated equipment is typically employed for small diameter (2- to 4-inch range) pipelines. Irrespective of the sophistication of the guidance system, this procedure requires considerable experience and skill on the part of the drilling crew to maintain the curvature of the drill string along its intended path and to prevent the pipe from becomming locked in the hole. The selection of any particular material depends on the product type, installation procedure, pipeline operational environment, and maintenance requirements. Material selection criteria for common pipeline materials are summarized in Table 62. Additional comments pertinent to specific pipeline materials are provided below. A comparison of pipeline materials for various installation procedures is reprinted as Tables 6-3 through 6-6. • Line Pipe - Line pipe is used for the long distance transportation of oil, gas, or water. Most line pipe uses welded joints and is ordered with beveled ends to facilitate a welding. However, line pipe can also be ordered with threaded or flanged ends. It is generally ordered in double random lengths (approximately 40 feet), but is also available in lengths of 10 and 20 feet. • Coiled Tubing - Coiled tubing is a continuous length, thin wall, small diameter pipe which was introduced in the late 1960s. Although originally used to service sub sea wellheads, it is increasingly being employed for gathering lines in small shallow water oil fields due to its suitability for a low cost reel barge installation. Coiled tubing is produced in diameters ranging from 1 to 3 inches. • Casing and Tubing - These are tubular products made specifically for oil, gas, and water wells. Tubing products are employed for the drill string, while casing products are used to line the well. They are furnished with threaded ends and couplings which facilitates rapid joining in the field. Because a welded joint is not employed, casing and tubing products can also be furnished with a polyethylene liner to prevent corrosion'or ensure product quality. What is bottom tension when pipe laying?